One merely has to step aboard the 119-square-foot cockpit area to know she is built for comfort and safety and ready for action. Along with the requisite in-sole fish boxes, I found a transom livewell and lazarette aft, a deck with deep channels to quickly drain deck water, and dedicated space already supplied for a Seakeeper gyro in the engine room. The mezzanine is set to starboard to accommodate the port-side access to the command deck and provides up close and personal seating for all the fishing action that is sure to happen there. I particularly liked the centerline helm mounted on a raised platform. Given the large wraparound windshield, with its posts pushed back on either side to create a single, centerpiece of glass, I could see, even at the dock, the great sightlines afforded with the design. noted she pirouetted like a prima ballerina—all a testimony to her fine design and engineering—my view into the seaway was just as it should be. And, of course, there is the essential custom tower by Palm Beach Towers, a Viking subsidiary. By the way, this association allows the company to always have direct influence on the design, fit and finish, and quality control. The expert electronics install is courtesy of Viking’s own Atlantic Marine Electronics. To port of the helm is a built-in console housing a tackle center, refrigerator, and storage locker. Over on the starboard side and aft is a seating area with a table. 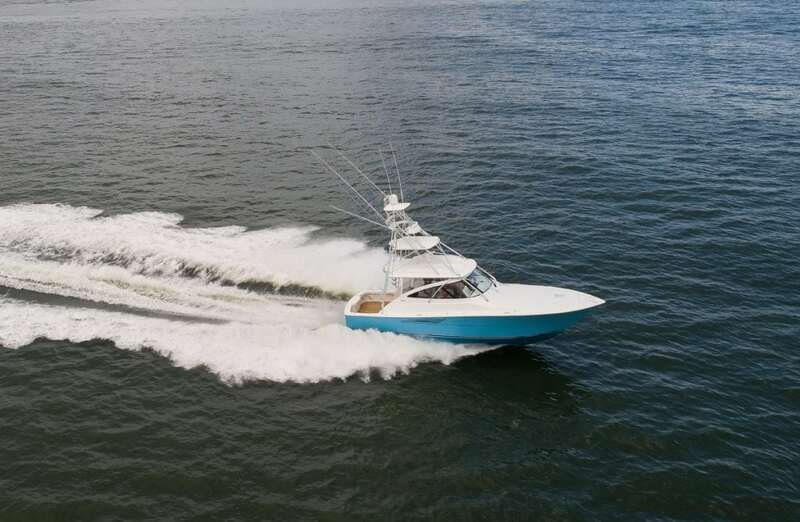 Access to the living accommodations is also to port, and Viking utilized every square inch of space to provide a livable and comfortable area in which to enjoy the time, whether it be overnight or longer periods after a day of fishing or cruising. The seating area on the Viking 44 Open has ah a table is to port and a quite comfortable alternative sleeping area for weary fishermen after time spent in the cockpit. Opposite from the full galley is all the counter space and equipment necessary for complete meal preparation. The breaker system for the entire boat is on the aft bulkhead. “Our design means you do not have to go searching for a particular breaker. It’s all here,” remarked Healey. The generous forepeak quarters, with a shared head to the central room, offer Viking’s attention to detail and excellent fit and finish work, as does the second stateroom located aft and under the command deck. Again, it’s a great space in which to catch some rest from angling action or for the kids to continue their adventures while underway, at anchor or in for the night. Regardless of where I looked, I found more than adequate storage room throughout the boat in which to pack clothing, fishing equipment, and food and drinks for extended time away from the dock. With the Viking 44 Open, it’s easy to see they’ve done it again. Gross Weight (Standard Fuel): 49,500 lbs.